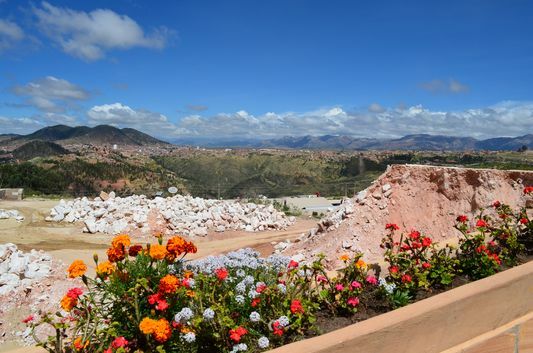 In my opinion, visiting Cretaceous Park is a must thing out of 12 things to do in Sucre, Bolivia. 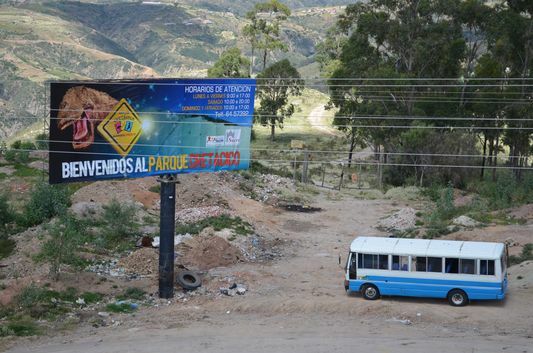 To get there take a bus number 4 from Sucre and get out at the last stop at Parque Cretácico just a few minutes from Sucre town. I was surprised when the bus driver told me to get out just outside of a cement company, it all looked destroyed around. But once I climbed up the hill and paid the entrance (30 Bolivianos for foreigners, 5 bolivianos for the camera), I understood why. 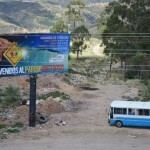 First, once I walked the hill up to the Cretaceous Park in Sucre, I watched a video about the dinosaurs and their life. Then a guide walked me around the park and explained me some important facts. We saw some replicas of different species of the dinosaurs, including the biggest titanosaurus tall 18 metres and long 36 metres which is the biggest sculpture of the whole world. We can see a replica of ankylosaurus which footprints were discovered in the South America for the first time here in the limestone wall. Only in 1994 the cement company Fancesa found at this place what is now the world’s biggest paleontological site – Cretaceous Park in Sucre. 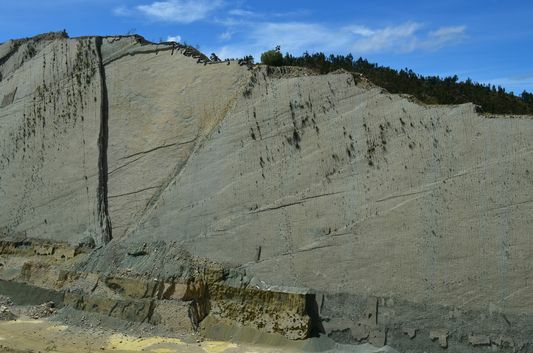 It is around 1,500 metres long limestone wall of Cal Orck’o, tall 110 metres that is covered by dinosaur tracks that died some 68 to 65 million years ago. 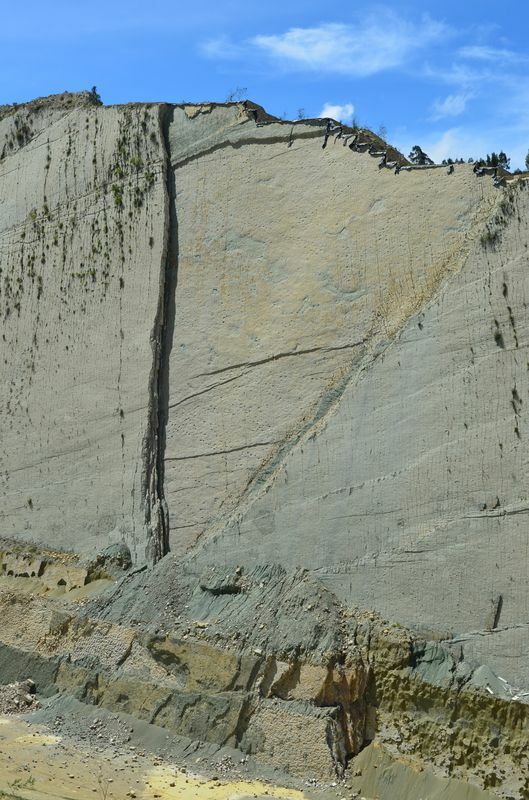 There are around 5055 dinosaur tracks of at least 8 to 15 species and 320 different animals. There we can see 581 metres of continuous walking of a middle size carnivorous which is the world record of dinosaur tracks in one place. I really enjoyed looking at the tracks at the wall, and all the life-sized dinosaur statues. There is also a souvenir shop and a museum with a lot of fossils, dinosaur bones and a replica of a dinosaur found in Chubut province in Argentina. Outside of the museum you can learn more about the past of the area from the pictures and explanations. I am really happy I paid a visit to this parque cretacico as I didn’t know it was the world’s largest dinosaur tracks site. And as I was sick and couldn’t do the trekking to Crater de Maragua observing dinosaur tracks in the nature, I could at least visit the park and see some dinosaur footprints there. Being from Slovakia it does not make it easy to get used to things one cannot find back home. Living in an apartment on the 6th floor for 18 years meant I hardly ever saw any unwelcome animals inside (not talking about pets now). Yes, from time to time we could see a big grasshopper but we’ve never figured out how it got so high. Beside mosquitoes, wasps, bees or some cute little birds (mostly sparrows) very occasionally we could also spot a bug. 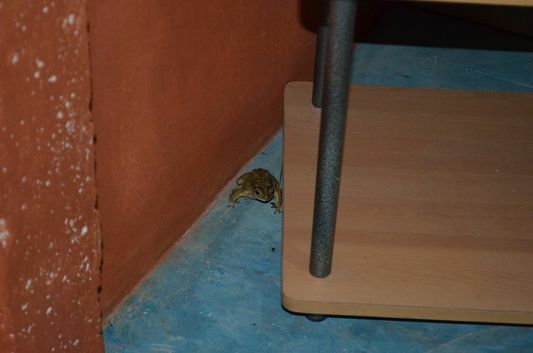 I have heard a mouse or a little rat could appear in a Slovak house but never met any face to face yet, thankfully! I am a huge lover of animals and like them so much our encounters sometimes make me cry of happiness and fill my heart with a gratitude. But insects, rats and some other animals just do not belong into the house or any other accommodation, I think. That being said, I’m afraid you can easily imagine my face each time I find an unwelcome animal in hotels or other type of accommodation I stay in when traveling around the world. 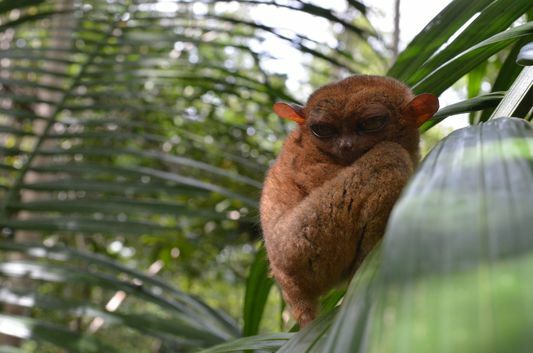 The worst to me is to see an animal late night, during the night or early morning which brings back my insomnia and maybe even some paranoia. The first time ever I was disgusted by such a thing was when I used to live in Madrid during the University. We found a cockroach in our apartment on the 4th floor and it took three people to kill it with a thick telephone book. Also one night coming back from a party it was dificult not to step on a cockroach when crossing a road as they were just all around. I still have goose bumps and a horrible look on my face when I remember it. I had many bad experiences with cockroaches ever since. Once in a cute hotel in Mexico, my room was just next to the swimming pool on the first floor so I could just open my door and jump into the cool water. I just took a shower after swimming and heard a tick tick noise when walking out of the shower. I saw 2 cockroaches passing underneath my room door and one headed straight into my open suitcase with clothes. I was terrified. I ran to the reception still with just a towel around me and half wet and scared the receptionist – a guy younger than me. He must have thought I was out of my mind or something. He just took a spray and sprayed it over one cockroach that was already leaving my room. It just turned over and died with its legs up. The second cockroach was more of a problem. The receptionist had to take all my clothes out of the suitcase, including my underwear (ouch!) and find the cockroach that then jumped out as if nothing so the receptionist just stepped on it. The end of the World War III. 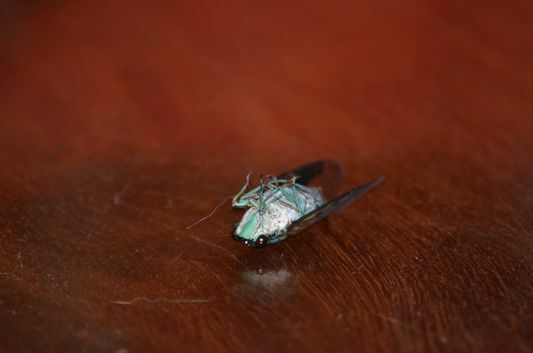 I am not even going to start about all the different bugs I have seen in hotels and houses around the world. I don’t even know most of their names. Costa Rica was one of the countries that trained my patience and dealing with disgusting feeling when seeing all those unwelcome animals. 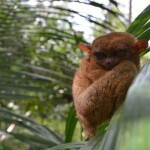 As most of Costa Rica is covered by rainforest, expect ”weird” animals you are maybe not used to. At least I am not. 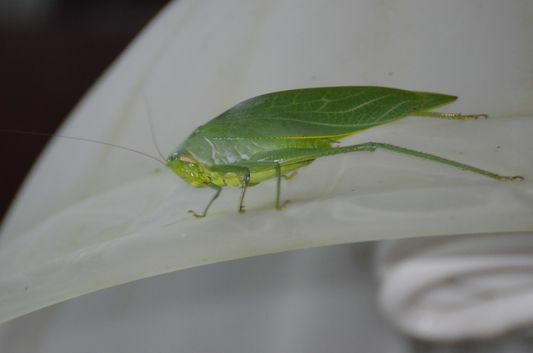 Huge green grasshoppers, lizards of every kind and colour, lovely blue-coloured crabs (at least these were beautiful), millions of ants (some of them bite and even get into your bed) and flying insects were what I got to see every day in my hotels and villas around. But as well very pretty humming birds that I found in my shower or bedroom. Once on Koh Lanta in Thailand I was sleeping and heard a weird noise coming from under my bed. I found out there were little frogs that maybe didn’t want me to be alone. I had to sleep with a shirt on my head not to hear them. Unwelcome animals in hotels or houses when traveling around the world don’t have to be something you won’t like. 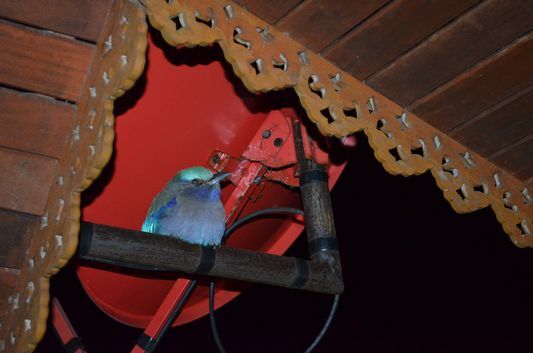 I remember we had a lovely visitor in my friend’s house on Koh Phangan (a Thai island) one night – a fat blue bird. 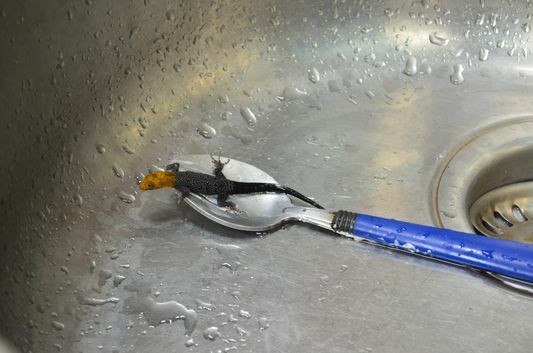 Do you mind to find unwelcome animals in hotels or houses around the world? What was the weirdest one you have ever seen? Where?